With long lines, inconsiderate luggage rifling, being treated like a criminal, and having to nearly strip down before getting through security, there’s no denying that flying has become more of a hassle than a luxury these days. But, what can we possibly do about it? 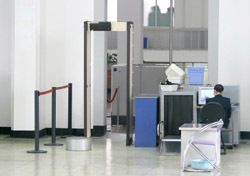 The Transportation Security Administration (TSA) has launched the Evolution of Security blog for passengers to air their grievances about the whole process. Now, instead of filing a formal complaint, which went into a file in some unknown location, you can share your experiences with others in a public forum (in response, of course, to the appropriate blog topic). The TSA also hopes the blog will be an informative place where people will learn why certain security checks are necessary. Though it’s important to have a place to vent, the question of whether or not the TSA will actually pay attention still remains. If not, the blog will be seen as just a way to pacify upset passengers. Only time will tell.